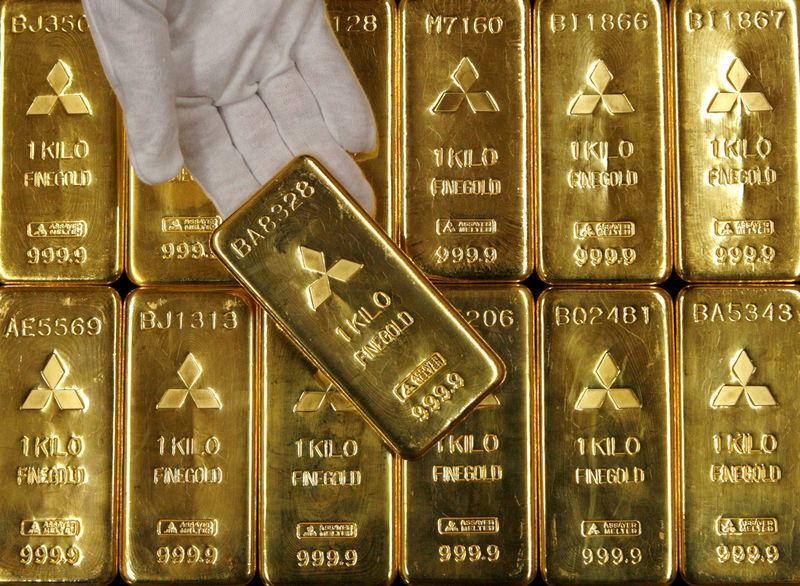 (Reuters) - Gold slipped on Wednesday on expectations of more interest rate hikes following remarks from a U.S. Federal Reserve official and as some investors booked profits after prices hit their highest in more than five weeks. Palladium, on the other hand, surpassed the bullion for the first time in about 16 years, to hit a new record high of $1,263.56 per ounce as higher speculative interest and larger supply deficit boosted the auto-catalyst metal. Spot gold (XAU=) was down 0.2 percent at $1,236.11 per ounce at 13:45 p.m. EST (1845 GMT). U.S. gold futures (GCv1) settled down $4, or 0.3 percent, at $1,242.60. "It's just the lack of interest in gold at the moment. Most of the interest is in the bond market," said Walter Pehowich, executive vice president of investment services at Dillon Gage Metals, adding that investors were also locking in profits after Tuesday's gains. Gold rose to its highest since Oct. 26 at $1,241.86 on Tuesday, helped by a softer dollar which has been pressured by concerns about weaker growth and bets that the U.S. Federal Reserve would end its tightening campaign sooner than previously thought. Fed Chairman Jerome Powell last Wednesday said U.S. interest rates were nearing neutral levels, which markets interpreted that the central bank would slowdown the pace of rate hikes. However, New York Fed President John Williams on Tuesday said the central bank should expect to continue raising interest rates "over the next year or so" even while it pays close attention to possible risks highlighted by financial markets. "He is contradicting the Fed chairman. That caused some downward pressure on the metal," Pehowich said. The central bank is widely expected to raise rates at its policy meeting on Dec. 18-19 and investors are keeping a close eye on signals for the future path of interest rates next year. 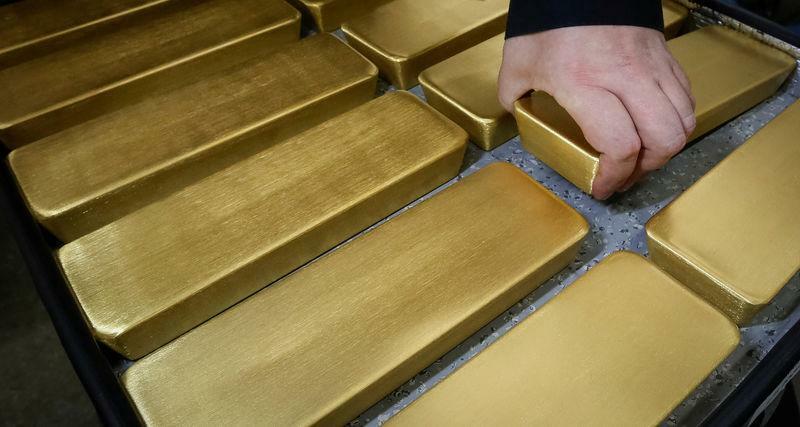 "As long as the end of Fed interest rate hikes is still open, the gold price is likely to suffer repeated temporary setbacks," Commerzbank analysts said in a note. Higher interest rates increase the opportunity cost of holding the non-yielding bullion. Gold prices have fallen about 9 percent from a peak in April when prices were trading around $1,365 per ounce. "The latest positioning data from the futures market show that there are extremely large speculative short positions in gold ... This shows that speculators have little faith in the upside potential for gold prices," ABN AMRO analyst Georgette Boele said in a note. Platinum (XPT=) was down 1 percent at $795.80 per ounce after hitting at $785, its lowest since Sept. 12, earlier in the session. "People are buying palladium and selling platinum as a hedge. They are thinking that palladium and platinum spread will continue to widen and that makes palladium an interesting investment," Pehowich said. Spot silver (XAG=) fell 0.4 percent to $14.46 per ounce.